Sabotabby posted this terrific graphic* at Punkassblog last year, yes. But it would seem that no-one has given the rabid Randians a heads-up about their dire need for some fresh, as-yet-undebunked talking points (and especially, some talking points that don't immediately inspire howls of derisive laughter among thinking people). 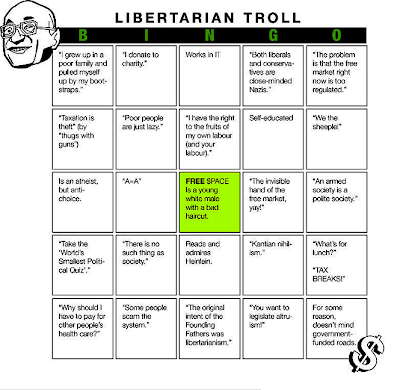 Thus, Libertarian Troll Bingo can be as much fun as it ever was. I mean, take the comments on Ezra's latest health care post--it's uncanny! I'm on my way to WIN, I tell you. *Unless you're blessed with a Super Best Friend's laserscope eyesight, I'd recommend clicking the image to enlarge it.